If you have a weak heart, don’t play this game. Seriously. I love first person shooters. I really do. Years ago, when I had a little more free time on my hands, I used to play Medal of Honor online around the clock. I was totally addicted. However, as time went on and life responsibilities took over, I was forced to set aside FPS games. I didn’t let them go for good. I’ve always gravitated back to them during a weekend when I just need some way to unwind. Here at MUO, I’ve gone back to the genre to review games like Critical Strike Critical Strike Portable Brings First Person Shooter Mayhem To Your Tablet [MUO Gaming] Critical Strike Portable Brings First Person Shooter Mayhem To Your Tablet [MUO Gaming] While not specifically marketed for tablets, let's face it - to fully experience any FPS game, you really need the larger screen of a tablet. You can purchase from a long list of great first... Read More and zombie games 6 Android Zombie Shooting Games That Are Tremendous Stress Relievers 6 Android Zombie Shooting Games That Are Tremendous Stress Relievers Zombie first-person shooters: A license to kill and blow up everything that limps its way toward you wearing tattered clothes and a half-rotted face. There's nothing quite as stress relieving as this - just shooting... Read More . I also love the fact that MUO has the genre covered so well, with articles like Danny’s review of Red Eclipse Red Eclipse - A Pulse-Pounding First Person Shooter Game Red Eclipse - A Pulse-Pounding First Person Shooter Game First person shooters are fun, no doubt about that. In fact, they're so fun, a ridiculous amount of first person shooters are now in existence. Counting out all the commercial titles (of which there are... Read More , and of course Dave LeClair’s lamenting that FPS viewing Why Are First-Person Shooters Not As Watched As Other eSports Why Are First-Person Shooters Not As Watched As Other eSports Read More should be as popular as sports is so true. So, recently I hit another slump where I just really needed to take a few hours to chill out with a good first person shooter. It had been a few months since I last had a long play session, so I wanted a game that was really fun – high quality, fast paced, and with an active online community. So, I was happily surprised to stumble upon Soldier Front 2, a free FPS offered by Aeria Games. It had all of that, and then some. 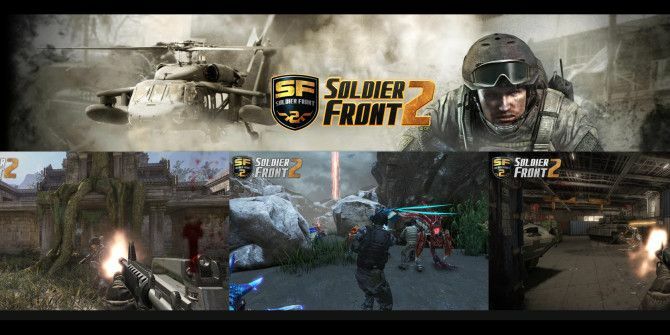 Soldier Front 2 is just one game in the collection of free games you can play using Aeria’s online gaming console. As you can see, there are other games in every category to choose from, if you’re the kind of person that likes to have access to a variety of games, you’ll like this service. Yes, there are lots of ads on the console, and of course the game has the sorts of micro-transactions typical of these free games. I can’t really complain though – because access to a game of this quality at no cost is worth ignoring all of that. The only downside to that is that other people can purchase equipment and pretty much sweep the floor with you, but there are ways around that. I’ll get to that in a bit. The first step when you launch Solder Front 2 is to create your soldier. Choose your Unit, and your preferred starting weapon. There really isn’t much more to it. I highly recommend using the training ranges, just to get a feel for the controls. Yes, you’ve got the typical FPS keyboard controls of WASD, Ctrl and Shift, but every FPS game has a different feel to the controls. Some are more fluid and natural, while others are quick and sensitive. So, pick a training ground to test your shootings skills and get a feel for the game. The Range is really the place to go, as you need to try and get through the training grounds in a limited amount of time. This is a great way to test your shooting accuracy and speed, your ability to move quickly while in the middle of action, and how to select targets quickly. At the end of the shooting range exercise, you’ll get a score. I’d recommend working your way through the range enough times to achieve a B or better. The idea is to practice moving fast, shooting while you’re moving, and hitting the target while you’re doing so. It’s not easy, but with practice you’ll get it, and it’ll be an invaluable skill once you enter into the arena with live players. Speaking of which, when you’re ready to rock, click on the Rooms button at the upper right and browse through the list of active servers and ongoing games. You’ll see deathmatches, capture, sniper games, shotgun games – all sorts of fun and crazy stuff that’ll help you blow an evening in the blink of an eye. My personal favorite is the deathmatch, and that’s the first game I started with during my testing. Graphics are pretty good. The demand for system resource and bandwidth wasn’t horrible, considering that I have less than some gamers have to work with. Yet, the game ran smoothly for me and I rarely found myself in a position where I got killed because of lag. The only time that happened was during prime time (after work) when a ton of people were on the Aeria network. Rounds are fast-paced and last roughly 10-15 minutes at a time. I have to warn you, you may think you can just play a round or two, but it’s crazy-addictive. You’ll keep wanting to play “just one more” until 2 or 3 in the morning. 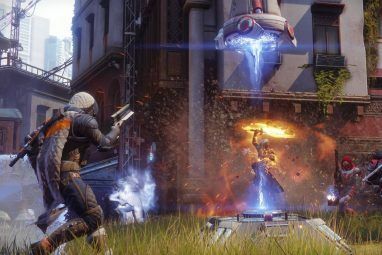 It is also tempting to invest in those micro-purchases, because you get annoyed very quickly of other people with bigger guns and better armor always pounding you into the ground, even when you’ve got better skills! The good news is that as you level up, you can get more weapons. Also, you get tempted by being offered the use of some advanced equipment for a few days at a time. It’s Aeria’s way of temping you to buy the equipment. Very clever! There’s also the option to play some non-standard versions of FPS. For example, instead of the standard game rooms, you could go over to “Hero Mode”, where you have a whole other set of arenas and “plots” to the game play. In one that I tested, you need to kill creatures and the enemy team to get your creatures to reach the other side and destroy the enemy home base. Mind you – it’s much easier said than done. If your creatures survive the enemy hoards, they also need to survive massive, stationary machine guns. Let me just say, it’s a bloodbath of human and alien guts. It’s a real blast. 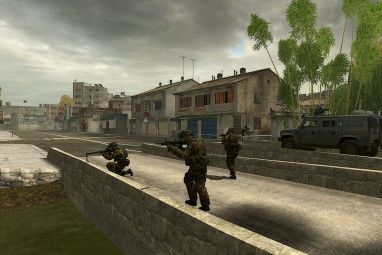 If you’re looking for a night of action, excitement, and heart-pounding military tactics, this is the game that you’re going to want to try right now. Looks good, I think I will try it out. Ever played Blacklight: Retribution? That is my current favorite free online FPS . Lots of weapon customization and it's not pay-to-win. you can't say that BLR is a bad game. 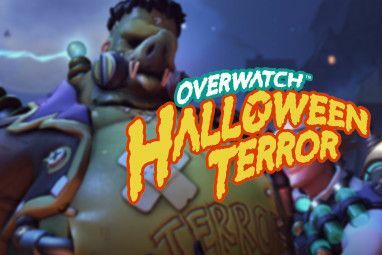 It's pretty much the top of the F2P FPS Genre at the moment, and has been like that for a solid couple of years.